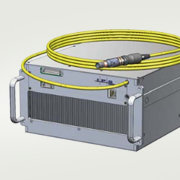 Fibercab FC Series - G & W Machinery Sales, Inc.
What makes the FC Series the next generation fiber laser system? 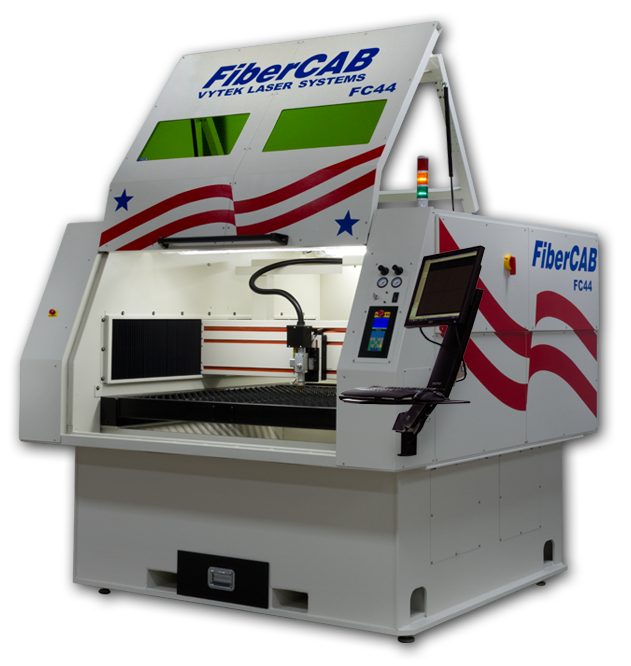 The FiberCAB combines the latest developments in fiber laser technology with next generation air- and water-cooled lasers. These attributes combined with Vytek’s high-accuracy positioning system and simple, easy-to-use CNC controls ensure that the FiberCAB series is the most advanced and cost effective, industrial-grade cutting system on the market. 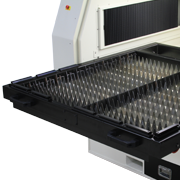 The FiberCAB series was developed to offer highly accurate cutting capabilities while maintaining the industry's most energy-efficient footprint. 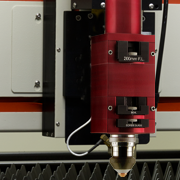 With its high-performance motion system and fiber sources, the FiberCAB achieves a level of quality and throughput that is unprecedented for a laser system at any price. The FiberCAB has just about the smallest footprint in the industry making it a perfect fit for even the smallest shops, yet the work area is as large as other machines with twice the footprint. The FC44 takes up less than 52 square feet of floor space and has an oversized work area of 4' x 4'. The FC48 has an oversized work area of 4' x 8' so larger parts are easily accommodated in either model. The soon-to-come FC55, FC510 and FC512 models -- with even larger work areas up to 5' x 12' and advanced features and performance -- will only be matched by competitive systems costing hundreds of thousands more. 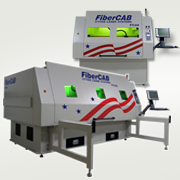 The FiberCAB lineup is available with a wide range of laser powers from 1000 to 6000 watts in both ultra-efficient, air-cooled and water cooled lasers, and in single or multimode fibers. With the FiberCAB’s modular platform, you can choose just the options you need now and upgrade later as your needs change. The FiberCab integrates a pull out slider table that extends from the system. This space saving design allows the FiberCab to maintain the smallest possible footprint while in operation while still allowing full access to the table when loading and unloading. The table system is uniquely designed to allow you to switch between spoil supports to honeycomb support. Vytek has a comprehensive training program including step-by-step manuals, written in easy to understand format. Comprehensive video training takes you through each step of the way insuring your up and running quickly. Technical support is just a phone call away and is located right here in the USA. The FiberCab is built upon a contiguous welded base design which provides exceptional rigidity. The mono block base is then ground flat to insure absolute precision for the positioning system. Combine this with the dual drive ground ball screws and easy to use CNC controls its makes an exceptionally precise and fast laser system. The FiberCAB is designed, built, and supported in the USA. Our Dual Focus cutting head assembly is designed for easy switch between short and long optic assemblies while maintaining the ability to change collimation optics on the fly. 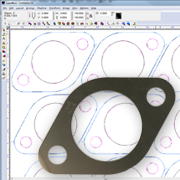 So whether you are cutting paper thin materials to plate you have the right optical setup.